• Pure Power – Models powered with Kawasaki® FX, Vanguard®, or fuel efficient Kohler® EFI engines. • New 60" X2 Wind Tunnel Deck – The industry's best cutting deck design is now available in a popular 60" deck width and retains the Wind Tunnel design with the industry leading 2-inch blade overlap. • Springer Forks – Provide ultimate comfort and performance, making the XCaliber one of the smoothest riding industrial mowers on the market today. 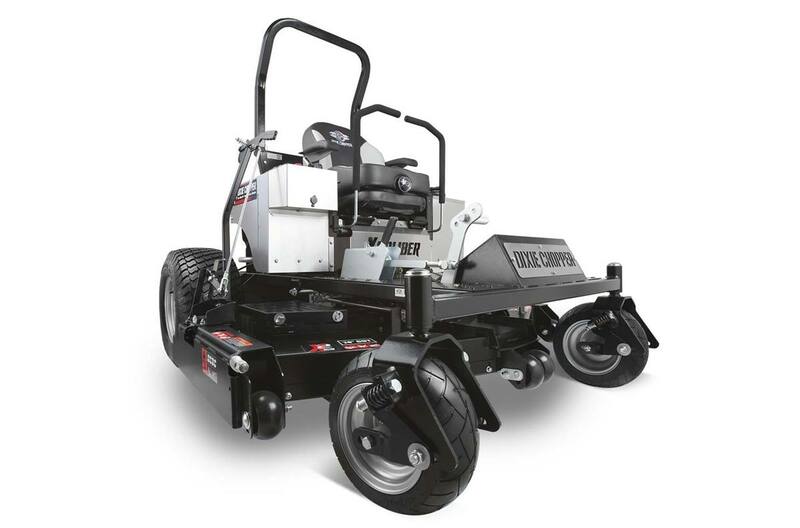 • Productivity – Our drivetrain configuration increases ground speed up to 13 mph to mow over 6 acres per hour. • New Deck Lift System – Offers better ergonomics and assisted lifting for operator convenience. Total Comfort - Suspension seat and springer forks for best quality ride. 2x 7 Gallon Fuel Tanks - Eliminate frequent fill-ups with more fuel capacity. X2 "Wind Tunnel" Deck - Increases airflow and recduces build-up inside the deck. Blades: 3 - 23.3" x 2.5"
Overall height (rollbar up): 78.5"
Overall length (rollbar down): 100"